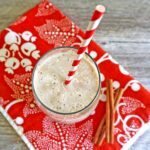 Creamy and refreshing, these delicious Peach Banana Chia Seed Smoothies are perfect for a healthy breakfast or snack anytime. 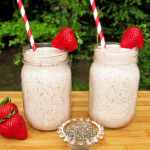 I love using chia seeds in smoothies and have shared a couple of my favorites here including my Strawberry Banana Chia Seed Smoothies and my Chocolate Banana Chia Seed Smoothies. 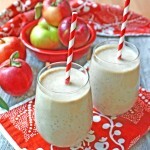 Today, I’m sharing another favorite, these delicious Peach Banana Chia Seed Smoothies. Late summer is peach season here in New England and peach picking is a favorite family activity. We are currently up at our lake house in Grand Isle, Vermont. There aren’t any peach orchards here on the island, so, peach picking will have to wait until we return to our house in Massachusetts. Luckily, the local island market and some of the larger farm stands often carry fresh off-island peaches, and my husband was able to pick up some fresh peaches at the market this week. Yesterday, after my morning run, I spied the peaches in the fruit basket. 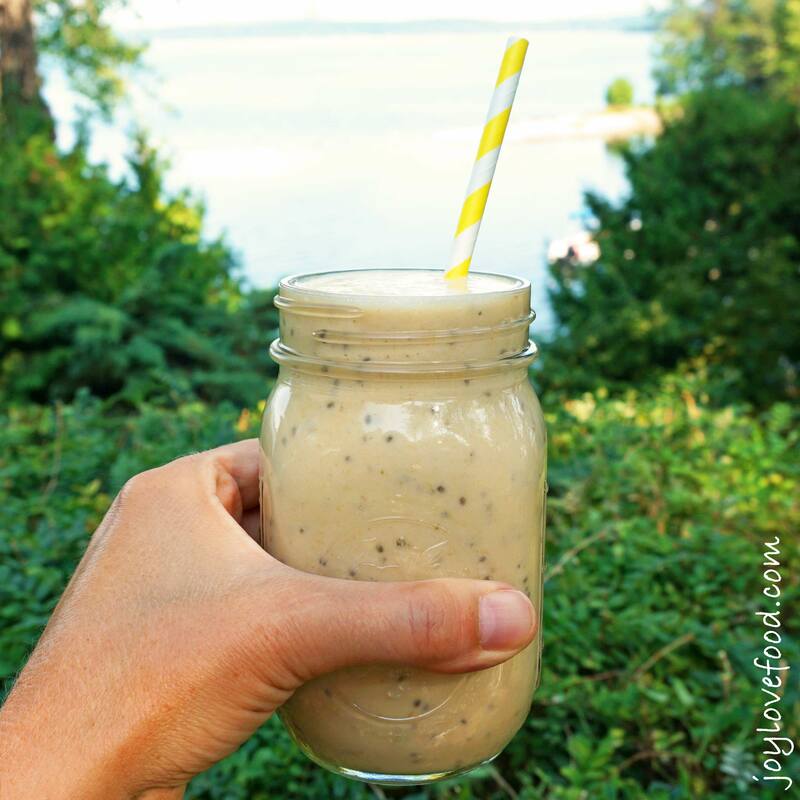 I decided to make a batch of these delicious and refreshing Peach Banana Chia Seed Smoothies. Peaches and bananas are such a nice combination. The chia seeds add additional fiber and protein. 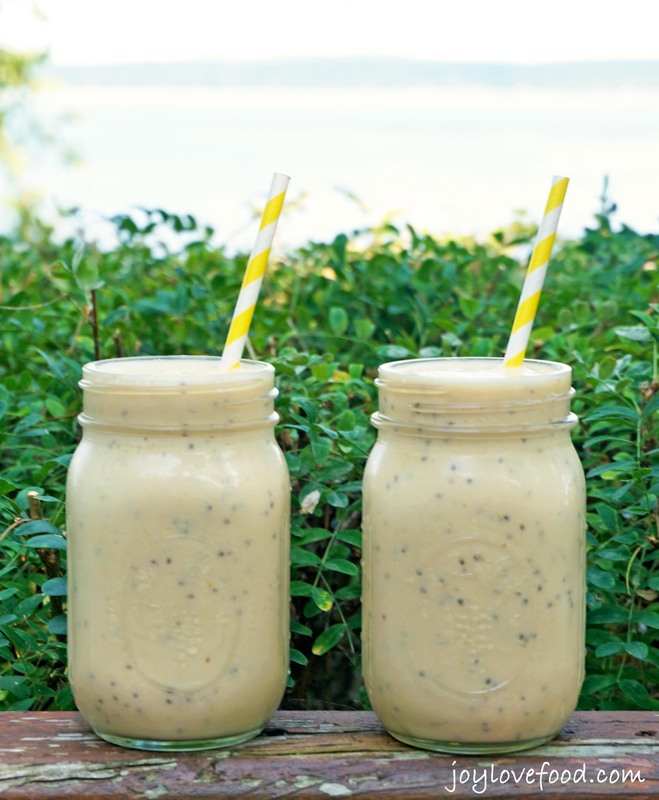 This recipe makes two smoothies, one was the perfect post-run snack. My husband, who was working from home, enjoyed the other. These creamy, refreshing smoothies are so easy to make. They are perfect for a healthy breakfast or delicious snack anytime. 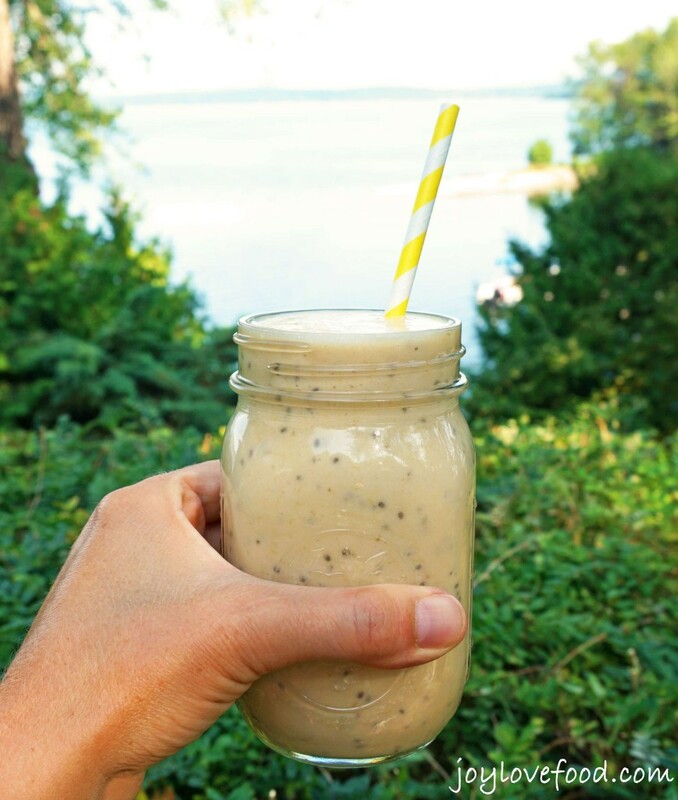 Add frozen banana chunks, peaches, yogurt, milk and chia seeds to a blender. If your peaches are nice and sweet, you may not need to add the honey. If your peaches are not very sweet you may want to add the honey or sweetener of choice. 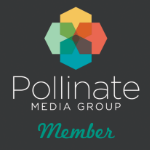 This entry was posted in Beverages, Breakfast & Brunch, Healthy Snacks and tagged banana, beverage, breakfast, chia seeds, drink, healthy, peach, smoothie, smoothies, snack. These look fabulous! I just got a vitamix this week and am pumped to make all kinds of quick new smoothies! I’m so glad I chose your link on #FriendshipFriday! I must try this smoothie with all of its peachy-ness. Thanks for sharing the recipe. This sounds like a great, I would love the combo for fruit flavors. I want to wake up to THIS!! And I think it’s awesome to find peaches and bananas and chia seeds all in one place!! AND in one sip! I have never tried chia seeds – that obviously needs to change. This looks so yummy! 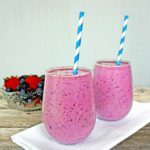 This smoothie looks so fresh, I love adding chia seeds to my smoothies too to make them a little healthier! I also love peaches in my smoothies, this seems like a great recipe for using peaches that are getting over ripe that you need to stick in the freezer. 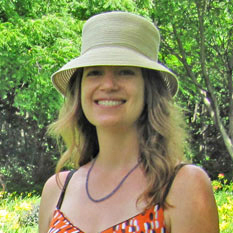 Talent Hounds recently posted…Got a “Blank Space”? Adopt a pet. 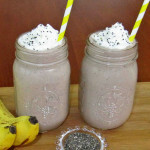 I love adding chia seeds to my smoothies too – great way to bump up the nutrition! And I can’t get enough peaches lately…yum! This looks like the perfect way to start the day. Yum! I’d love to try this with some greens added to it 🙂 It looks delightfully thick! I love chia seed anything!! 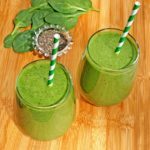 These smoothies look so tasty and healthy – love your idea! I will def. try them for breakfast! I still have left over fresh peaches and this would be perfect for this recipe. Great way to start the morning off right. I don’t like ice in my smoothies so the frozen banana is perfect. We are still getting peaches here in Georgia although they are almost gone. What a great way to enjoy them. Smoothies are a staple in our house. I just grabbed a large amount of peaches from the farmer’s market the other day, so yup, I’m trying it! i could wake up to this!! I love a good smoothie! The peaches are just ripening here in Idaho. Sounds so delicious! It is peach season here too and I need to get baking and now making smoothies. Pinned!